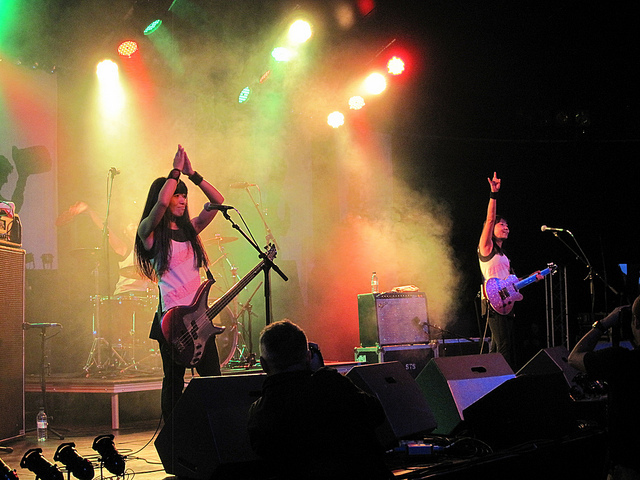 Grin-inducing Japanese energetic, upbeat and catchy all-girl pop punk entertainment with the ingredients of a classic rock show: Shonen Knife are an infectiously enthusiastic trio and a lot of fun to watch. Songs with Descendents-esque novelty value about what food and drinks had been consumed earlier (“Banana chips” the entrée, “Ramen” was had for lunch, washed down with “Green Tea” – Osaka is not for nothing known as “Japan’s kitchen”). Their well-rehearsed live shows are a polished affair with choreographed dance moves, synchronized devil-horn throwing and headbanging in unison. Bubble-gum punk influenced ‘70s hard rock meticulously performed in a light hearted and upbeat manner. Enter Ramones, AC/DC, Buzzcocks infused with saccharine sweet 1960s pop group melodies, peppered with a lyrically simplistic content. Band member introductions and polite explanations of how much they enjoy meeting us in “insert name of town of the night”-rock city. The politeness of the three ladies clad in shiny dresses was reciprocated by the audience who respectfully lapped up stage banter. Smiles all around.